A visit to the Baltimore area is not complete without taking one of the U.S. Naval Academy tours in Annapolis. The chance to see the U.S. Naval Academy in person gives you the opportunity to experience traditions that date back to 1845 when the academy began as the Naval School with a brigade of 50 on 10 acres of old Fort Severn in Annapolis. The Naval Academy campus now spans 338 acres and boasts a brigade of 4,000. 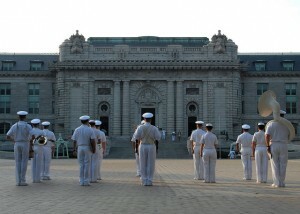 Naval Academy students are considered midshipmen on active duty in the U.S. Navy. Students attend the Academy for four years, each graduating with Bachelor of Science degrees and then commissioning as Ensigns in the Navy or Second Lieutenants in the Marine Corps. Several tours are available for individuals, families and groups. Begin your visit at the Armel-Leftwich Visitor Center where you will first watch a 13-minute film entitled “The Call to Serve.” Public walking tours of the campus, also called the Yard, depart daily from the Visitor Center and are led by a professional, certified guide. During the campus tour, you’ll learn about the history of the U.S. Naval Academy, as well as its impact. You’ll also learn about the Beaux Arts architecture prevalent in campus buildings, as well as take notice of numerous monuments celebrating important leaders and events. Tour fees are as follows: adults $10, senior citizens $9, children (1st grade through 12th grade) $8, and pre-school aged children are free. In addition to the walking tour, the noon formation of the Brigade is a popular daily attraction on the Yard. The formation is held weather permitting weekdays during the academic year and Monday through Saturday during Plebe Summer. 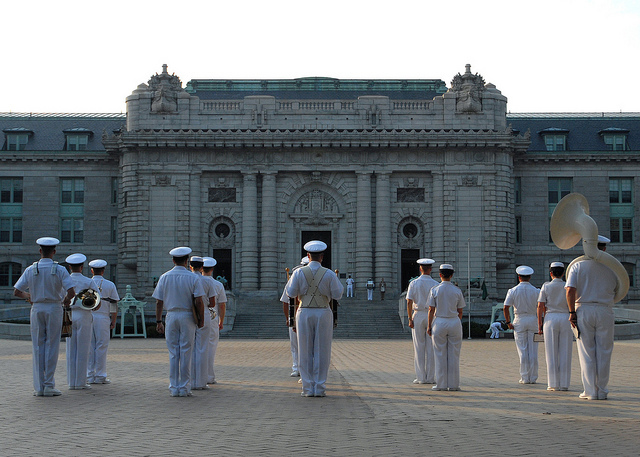 Plebe Summer is the summer new midshipmen begin their four-year program. Special group tours are available for groups of 16 or more. Group tours include a historical tour and tea at the Naval Academy Club and a corporate leadership and training tour. While you’re visiting, plan to stop by the U.S. Naval Academy Gift Shop and the Museum Store for a few souvenirs. The gift shop offers everything from hats and T-shirts to jewelry and tailgating gear. Visit the online store for a preview of the items on sale in the gift shop. The USNA museum, which spans two floors, is free and open to the public seven days a week. The gift shop has a large assortment of naval history books, prints, models, gifts and educational toys in stock. All proceeds from the sale of merchandise benefit Brigade of Midshipmen activities. While picnicking is not allowed on the grounds of the U.S. Naval Academy, you can grab a bite to eat at the Drydock Restaurant in Dahlgren Hall. The Drydock has a menu of deli-style sandwiches, grilled items and pizza. It’s open seven days a week and offers indoor and outdoor dining options. The Naval Academy Club is also open to the public for a buffet lunch during the week from 11 a.m. to 2 p.m. Visitors 18 and older must have a government issued photo ID. International visitors must have an original passport. You will need to park outside the gates and enter using one of the pedestrian entrances, unless you have a U.S. Naval Academy ID, a Department of Defense sticker or handicapped tag on your vehicle. The Wayside Inn, a historic bed and breakfast in Ellicott City, is a short drive from the U.S. Naval Academy in Annapolis, Md. The Wayside Inn offers six beautiful rooms, as well as a gourmet breakfast to start each day. What Are the Best Washington DC Monument Tours?